Riad Tafilag Location. 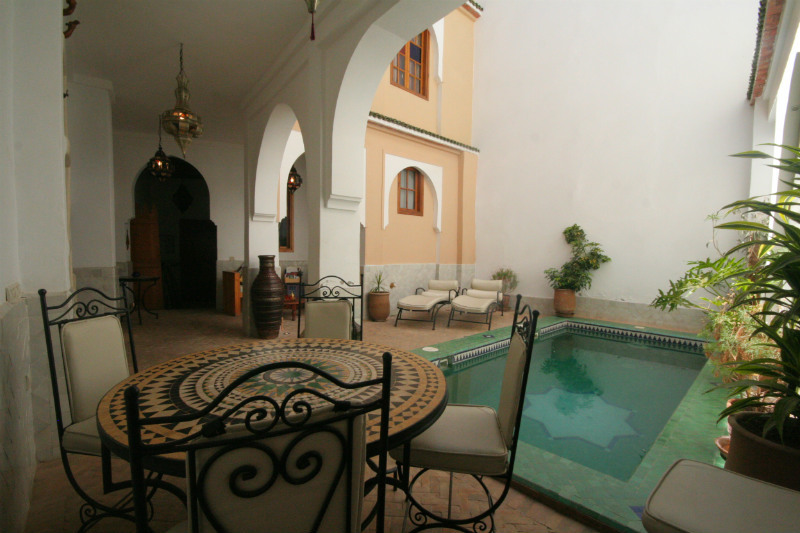 Book Riad Tafilag Today with Hip Morocco - Holiday Accommodation in Agadir & Taroudant, Morocco. 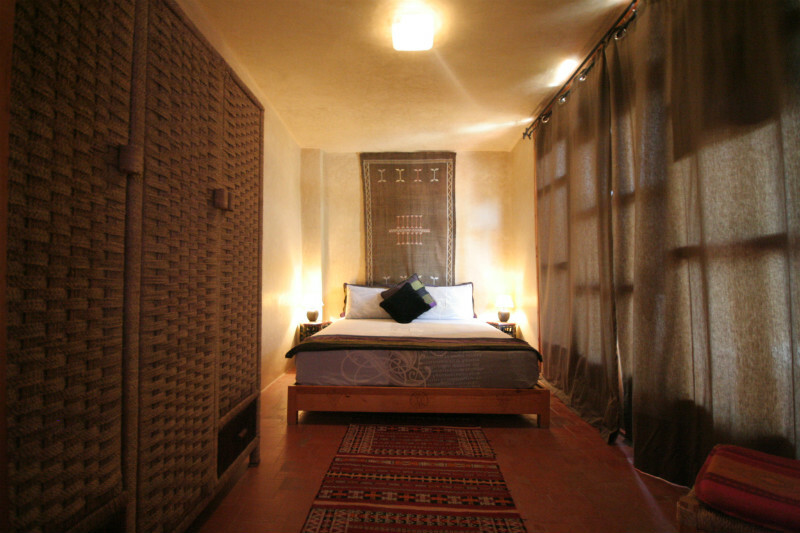 "A beautiful contemporary Moroccan homely with excellent service"
Riad Tafilag is a spacious uniquely designed Riad in Taroudant with 8 individually designed and attractive rooms split onto 3 floors. The young staff at Riad Tafilag offer a very fresh and professional service on your stay in Taroudant, with a very good local knowledge of the area, along with wonderfully prepared cuisine by the kitchen team. 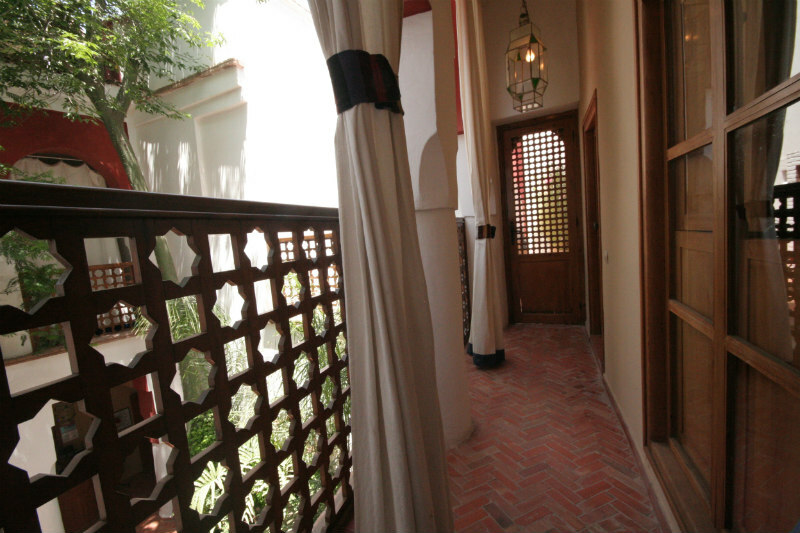 This Riad in Taroudant has been designed with a luxury homely quality, keeping its Moroccan roots but with a very well presented collection of more modern conveniences making your stay in Taroudant a very special and relaxing experience. 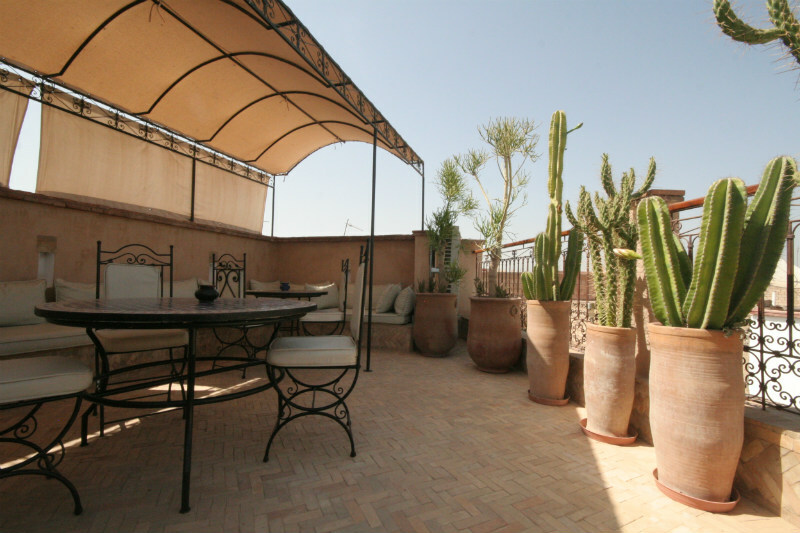 Riad Tafilag boasts several open terrace areas, quite a special feature in the Riads of Morocco, with the options of secluded seating areas, sun baked lounging and shaded dining areas located in 4 different levels. 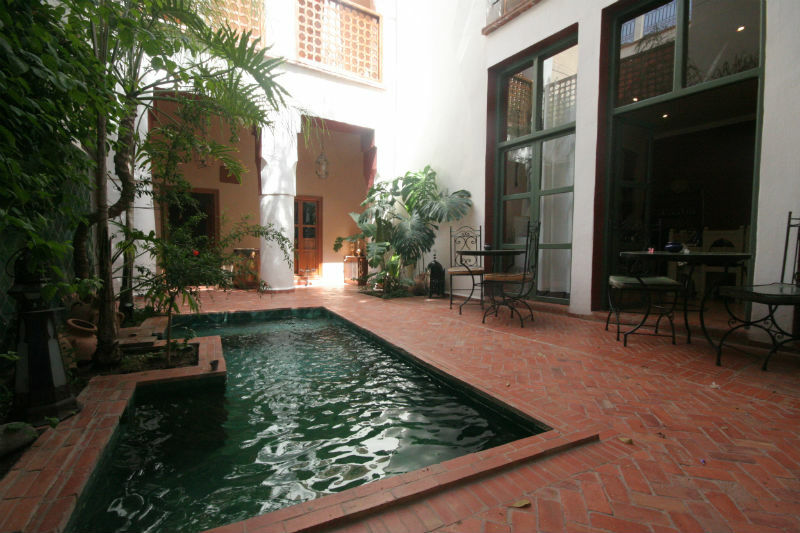 This Riad in Taroudant has 2 ground floor patios with dipping pools furnished with a beautiful collection of plants, smells, music and intimate seating areas. 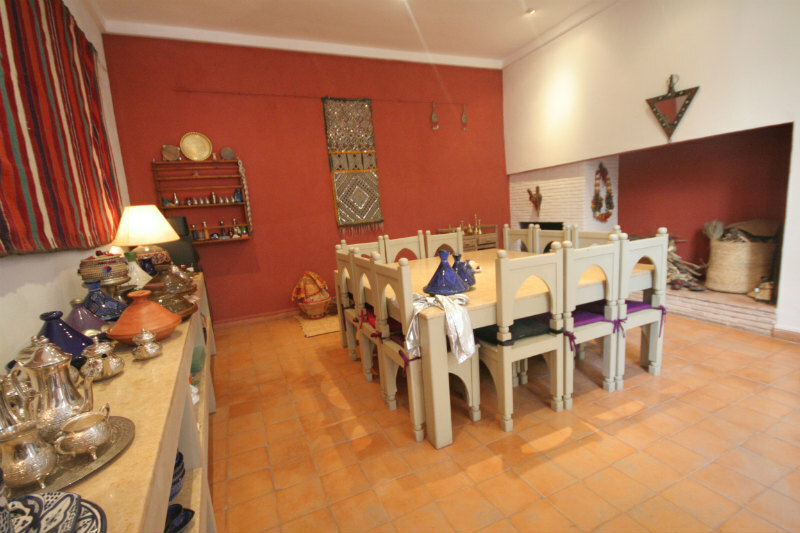 This small and quiet restaurant in Taroudant offers guests a sensual romantic atmosphere with friendly staff and suitable for smaller budgets. Although no alcohol is served, the quaint Moroccan decor makes this a very relaxing experience. Situated in the grounds of Riad Maryam, this restaurant offers a taste of homely Moroccan hospitality, with a large array of Moroccan tasting salads and a family friendly atmosphere. 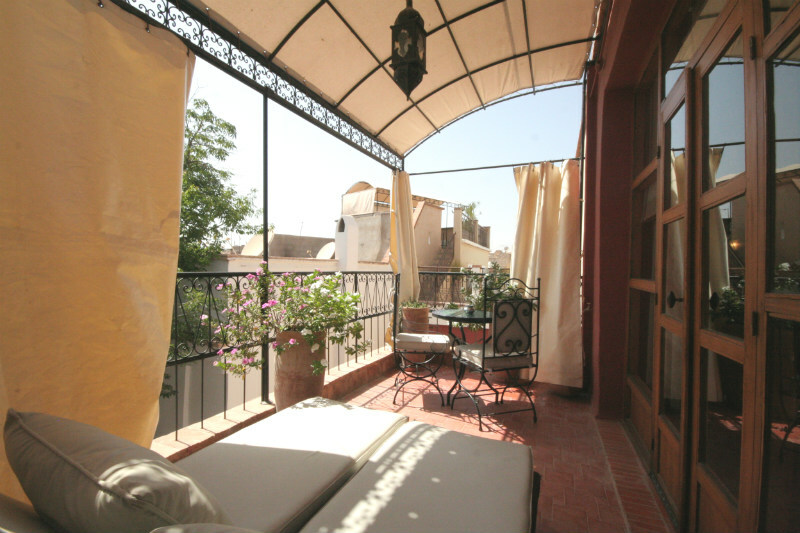 Located 5 minutes for Berber and Arab souks, Riad Tafilag is situated in the north of the medina. The main square with its traditional Moroccan family atmosphere is a short walk and the Kasbah, beautiful in the evening is a 10 minute walk. 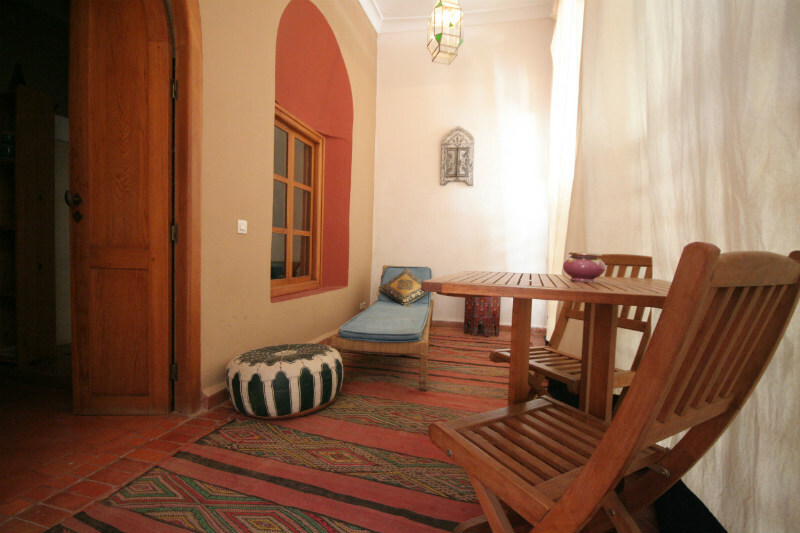 This cosy double room is located on the ground floor of Riad Tafilag opening onto the 2nd patio with dipping pool and sun loungers. 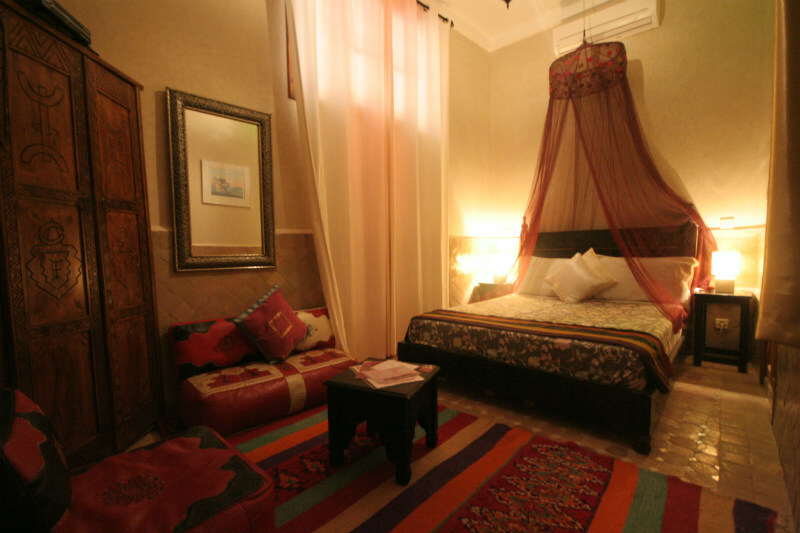 The rooms has an intimate harem atmosphere with deep purple mosquito net, perfect for a romantic holiday in Taroudant. 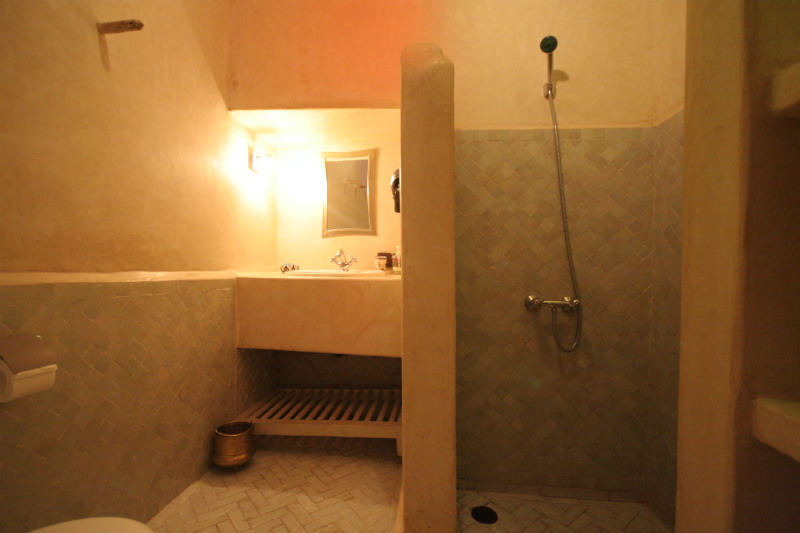 The ensuite bathroom is decorated with the traditional moroccan building technique of tadelakt in a cream colour and superior 2 headed shower. 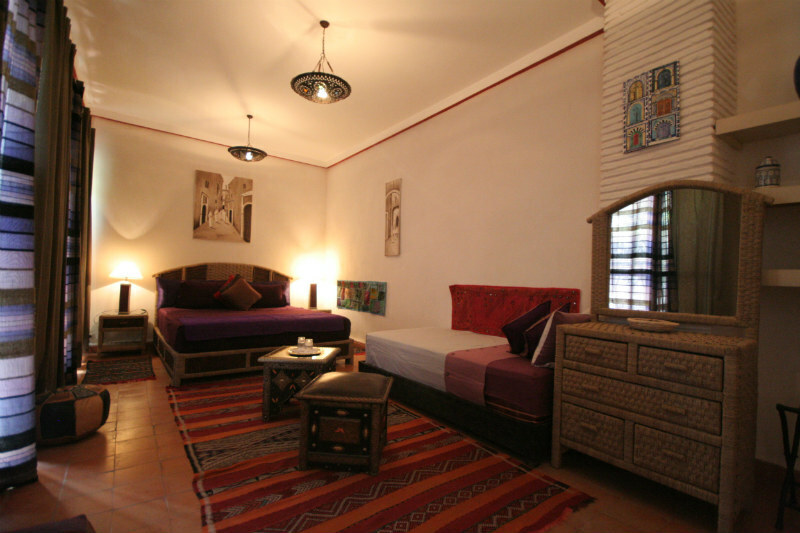 This triple rooms has 3 single beds or a double and a single, and situated on the ground floor of Riad Tafilag. 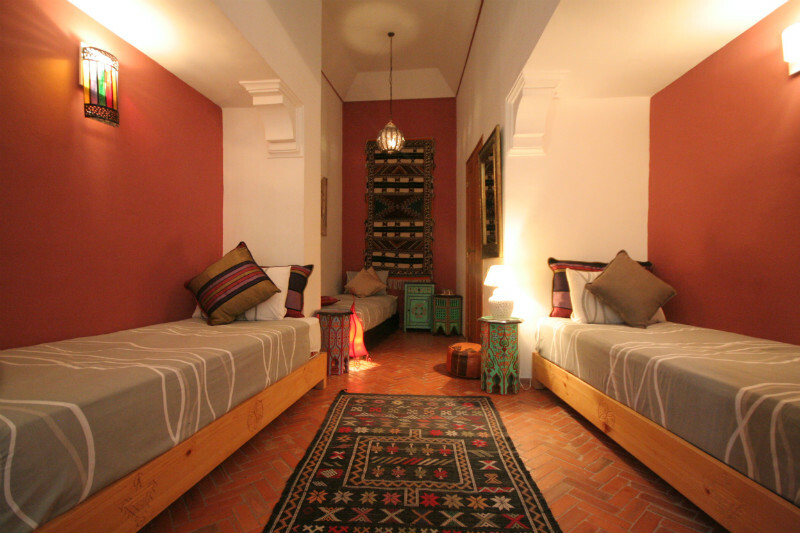 This cosy rooms has mauve and white walls and rustic stone floor and small seating area with ornate Moroccan poofs. 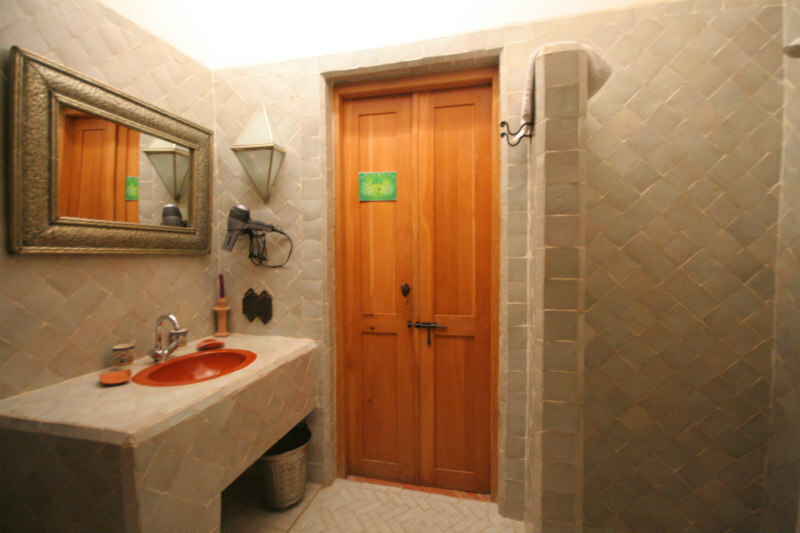 The bathroom is spacious and simply furnished with plenty of fresh natural lighting and walk in shower. Perfect for a group holiday in Morocco with close friends or small family. This room is located on the ground floor, opening onto the main patio an small dipping pool surrounded by healthy plants offering good shade. 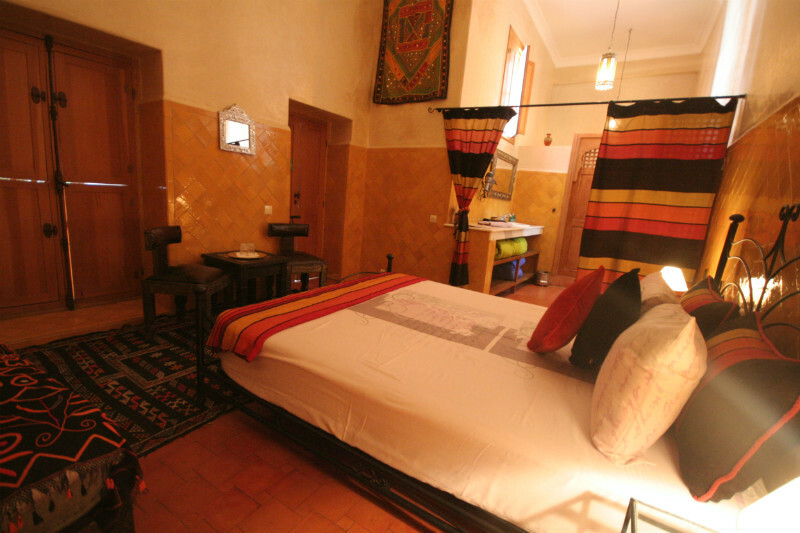 This double room at Riad Tafilag has a good use of its space with large double bed and Moroccan sofa. The salon/ extra bedroom is simply furnished with sofa bed and separate from the main bedroom by a Moroccan draped curtain. 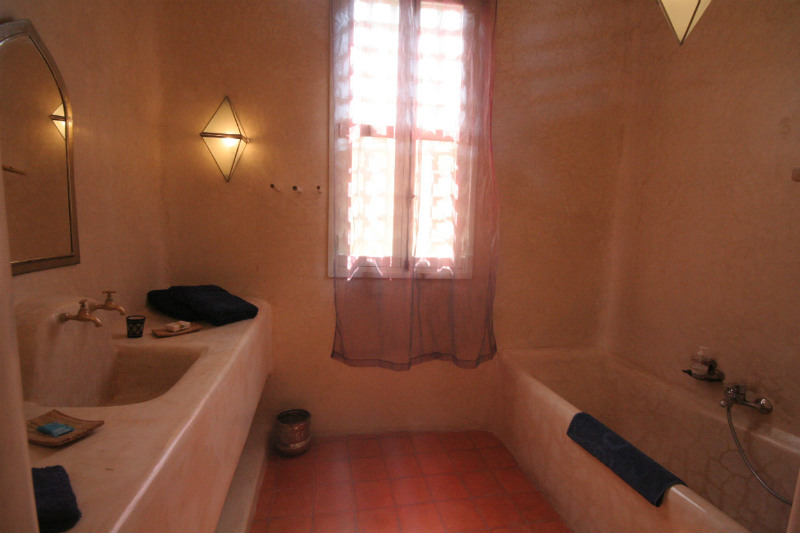 The bathroom is in a intimate Moroccan village style, with cream tadelakt walls and walk in shower. 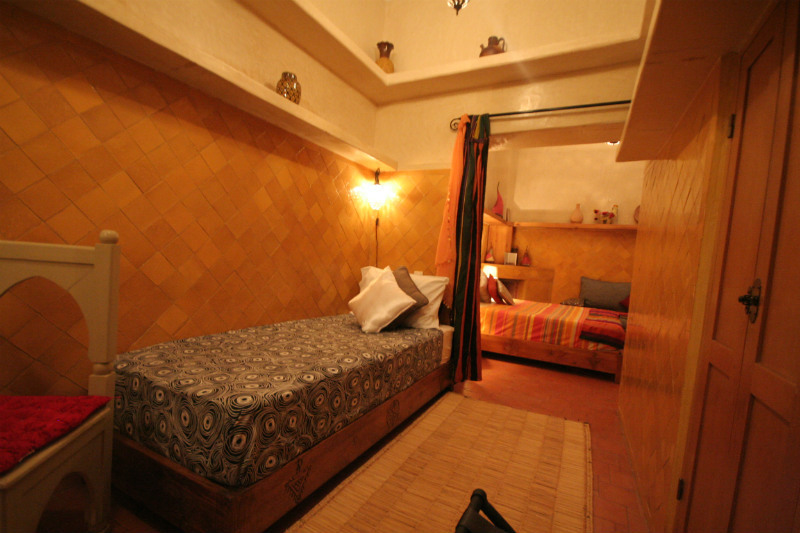 A room in Ria Tafilag perfect for a small family holiday in Morocco or coupe wanting a little more space. Situated on the 3rd floor, this dark sensual room is spacious with large a double bed. 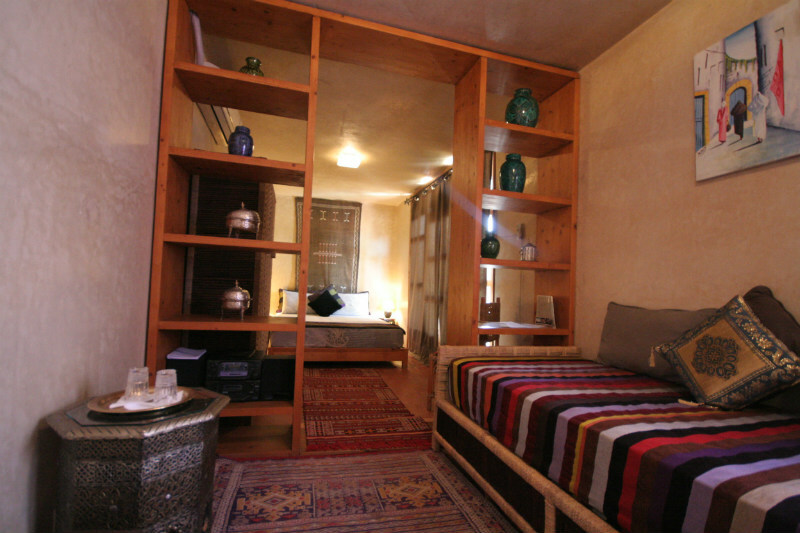 This room at Riad Tafilag has a grand Berber floor rug alongside long salon bench sofa. 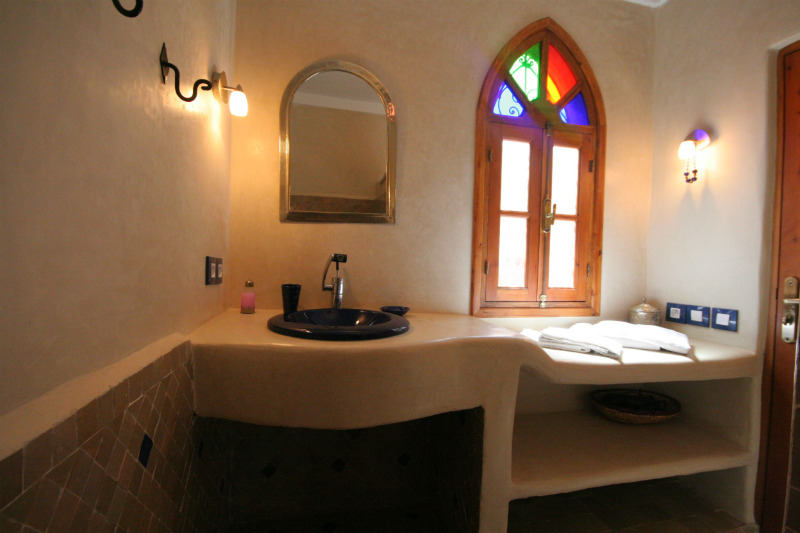 The bathroom of the Ayma room is a good size with large shower and deep cobalt blue Moroccan style washbasin. 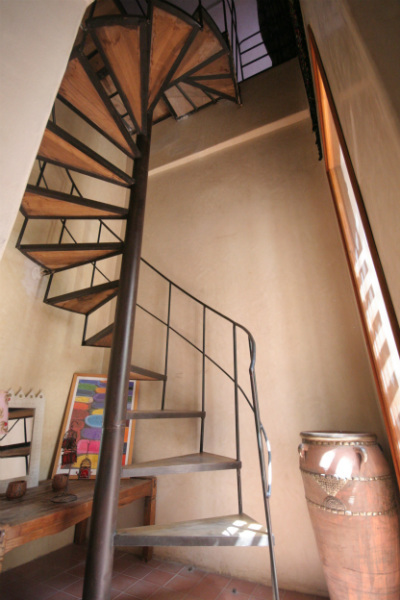 The Argana room at Riad Tafilag is on the 1st floor accessed by a set of spiral stairs. The large private balcony looks down onto the main patio and small dipping pool, and can be enclosed off with long draped curtains. 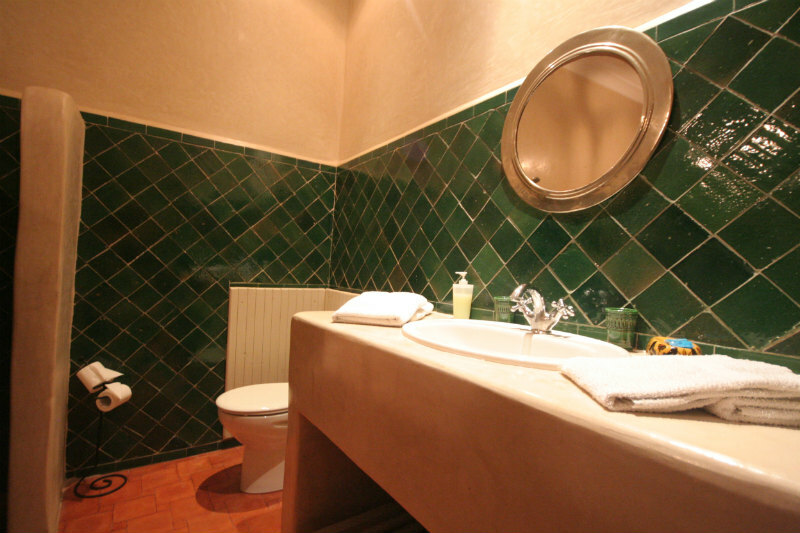 The cosy bedroom has green tiling and metal frame bed creating a dark intimate atmosphere. 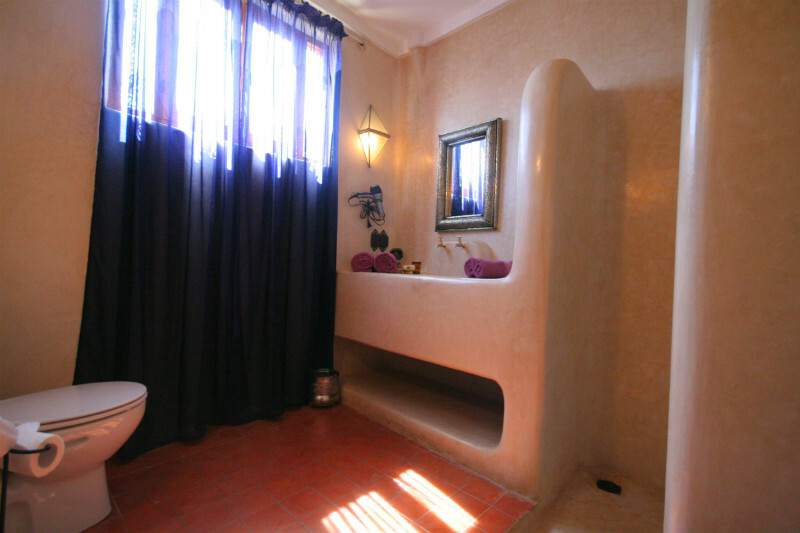 The bathroom is open to the bedroom separated by a head height tadelakt wall and no door. The bathroom is a good size with walk in shower. This room is located on the 1st floor with a small private balcony at its entrance. 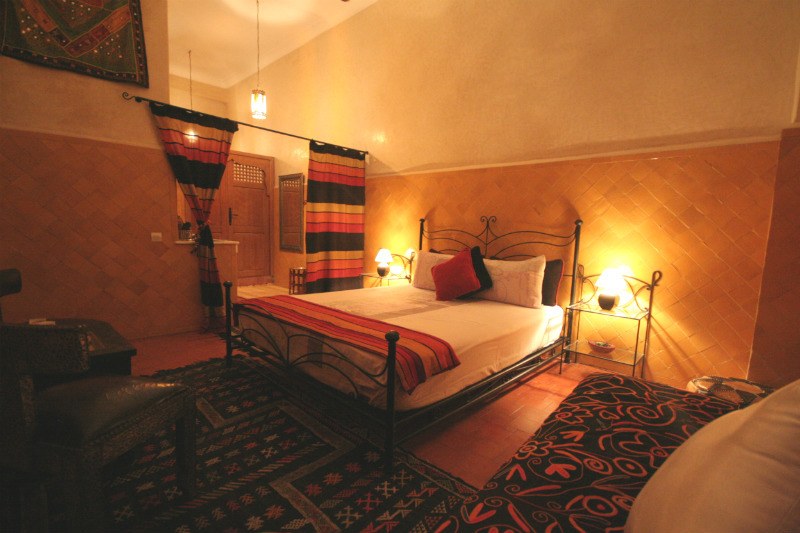 The spacious bedroom has a large double bed alongside Moroccan style sofa bed seating area. The large shuttered windows allow plenty of natural light into this intimate sensual room. The large bathroom is separated by a draped curtain from the main bedroom and has a large dressing room/ wash basin area leading to the separate shower room. 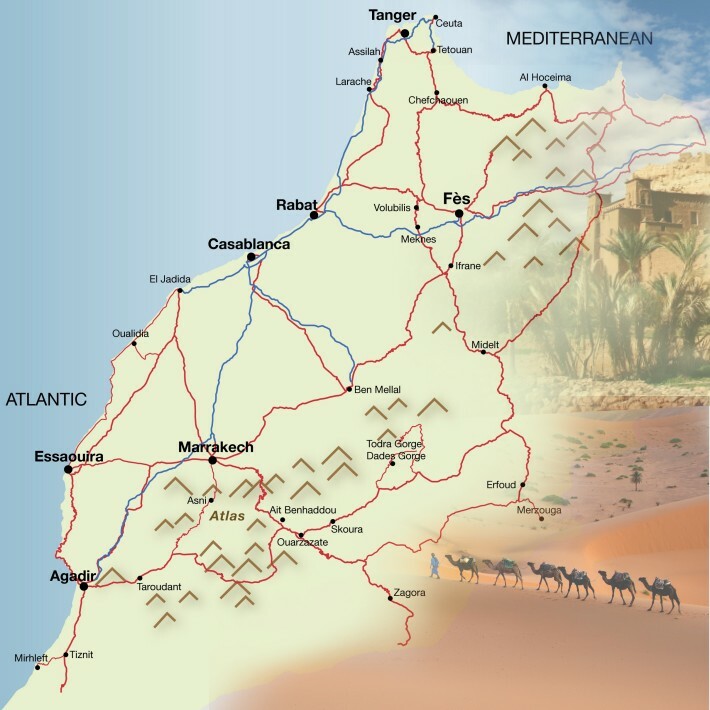 A perfect choice for a honeymoon in Morocco or romantic getaway is this ancient city. 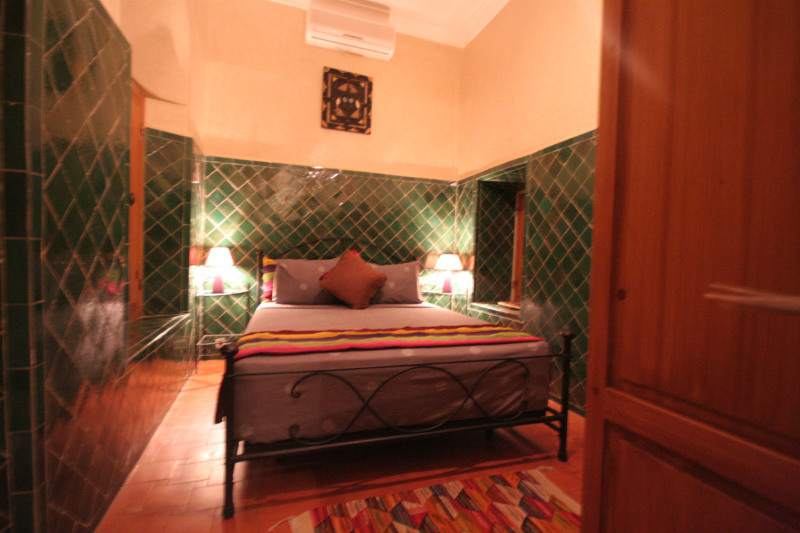 This large room has two level and situated on the 1st floor of Riad Tafilag. The 1st bedroom/ salon had a cosy. Sofa bed with intimate lighting. The main bedroom is accessed by a spiral staircase leading for the room entrance, and has been beautifully crafted in an oriental style with large double bed. 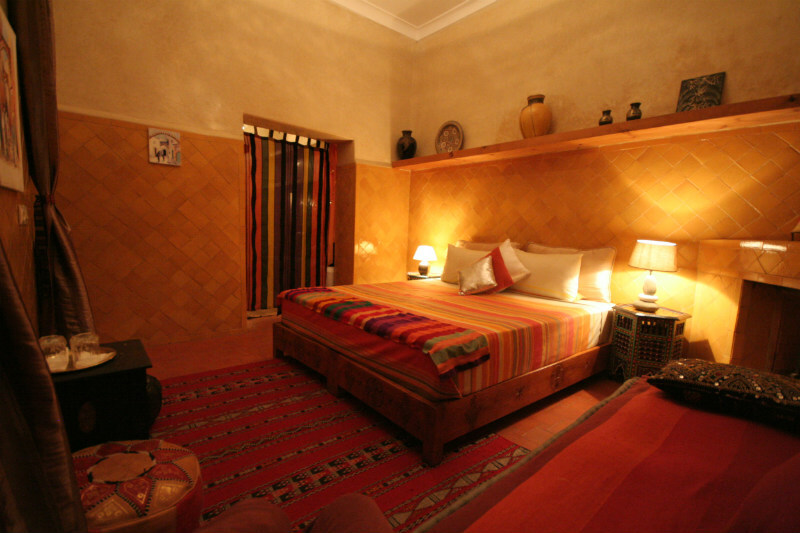 This room at Riad Tafilag a collection of Berber rugs and Tuareg textile artwork. The bedroom open onto a intimate private terrace with sun loungers and small Moroccan table and chairs looking down onto the main patio and pool. 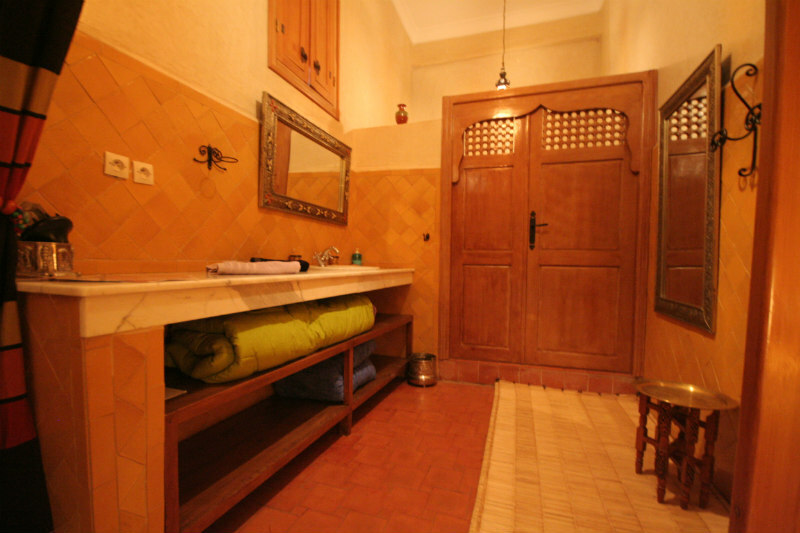 The spacious bathroom is simple yet beautiful, with cream tadelakt walls and large walk in shower. 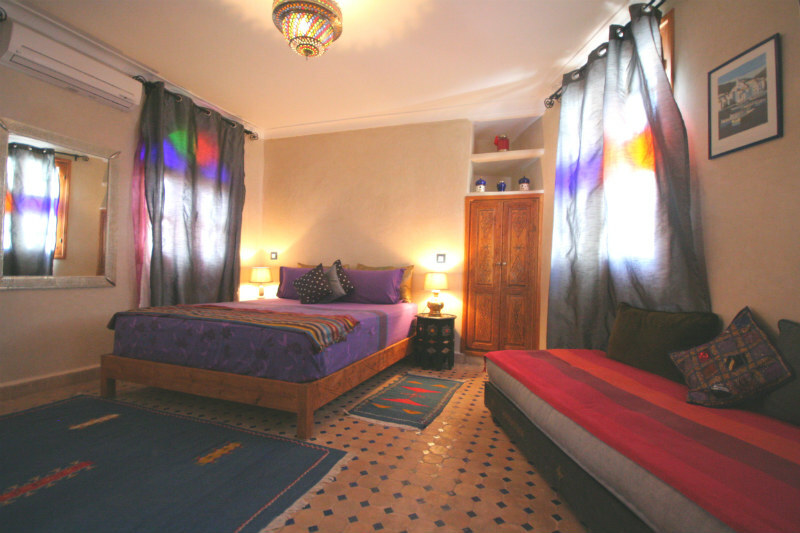 Perfectly siuted for a family stay in Taroudant or spacious romantic getaway in Morocco. Located on the 1st floor of Riad Tafilag, the Atlas room is very spacious with a private balcony looking down on the main patio pool. This room has a large double bed enclosed by a ornate wicker wood bed frame. The in room salon area had a sofa bed alongside a wicker dressing table. 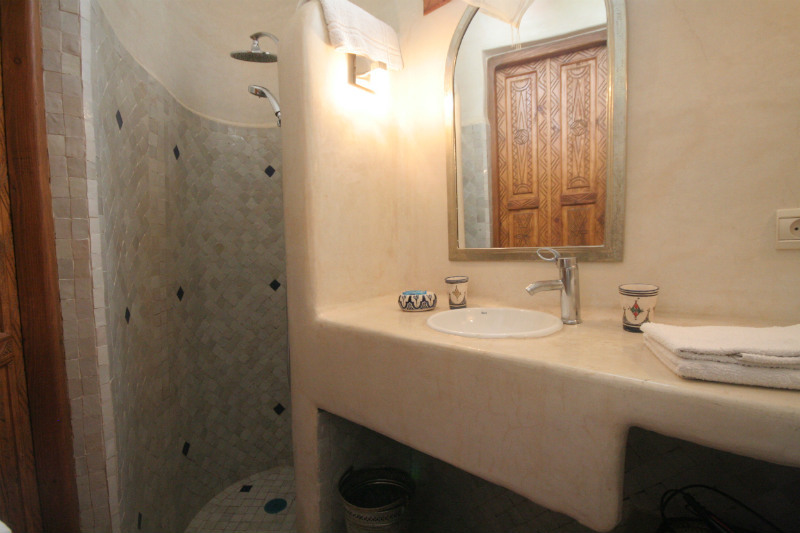 The large ensuite bathroom has a fresh and light atmosphere with hand crafted deep tadelakt bathtub and shower. 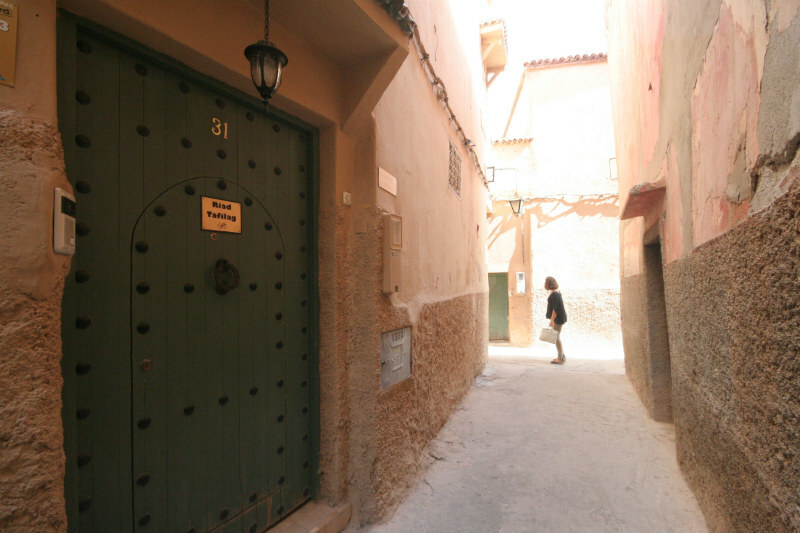 The base rate price at Riad Tafilag is in pounds, euros, or Moroccan dirhams and exchange rates are approximate.